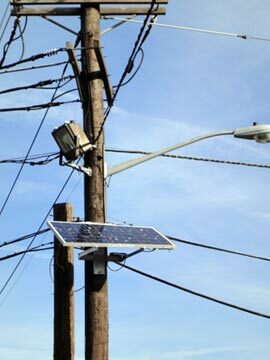 pole-mounted solar panels | Westwood, NJ--Pascack Valley Blog. Luckily, the regional headquarters of mrwestwood.com has been replete with electricity for the duration, and aftermath, of hurricane Irene. However, as early as 8am this morning, numerous neighborhoods throughout Westwood, and throughout the Pascack Valley, have experienced extended electricity outages. This sent many people in low-lying areas scrambling for generators to power the sump pumps to keep their homes from flooding. Eleven hours later, electricity still has not been restored. There were no significant reports of high winds in the region overnight, yet PSE&G couldn’t do the most important thing it is charged with doing–keep the electricity flowing. Do you live in a neighborhood which lost power today? Does your neighborhood have those useless solar panels flying high on the poles? We had a sunny afternoon in Westwood. Why wasn’t the solar panel sending power to your home? Because PSE&G’s solar panels do nothing. Questioning PSE&G Solar Panel Applications in Westwood. It didn’t take long to notice the numerous solar panels that have recently sprung up all along southern and eastern sections of Kinderkamack and Old Hook Roads, respectively, in Westwood. There are a number of them on Bergenline Avenue as well. Solar Panel in Westwood, avec bird crap. These solar panels are installed by PSE&G and are supplied by a New Jersey company, Petro Solar. A review of the company’s documentation regarding its SunWave UP Series reveals some interesting aspects about its design. The panels are designed to be mounted on utility poles at a minimum of 14 ft. from the ground, and at a 30 degree angle from horizontal. Each panel supplies secondary (transformed) power directly to an end-user or power consumer, such as a street light. These units are not connected to the primary power distribution lines, so they do not supply power back to the grid for use elsewhere. These units do not contain a battery to store energy, so the power they generate is only available for immediate use at a limited distance from each panel. In other words, as power is generated by these solar panels, you must use it or lose it. Still, not a bad idea to get one’s feet wet in sustainable, clean energy. Only one problem. Most of the solar panels installed in Westwood appear to only be connected to street lights that are in use after dark. Since these solar panels have no battery to store energy generated during the day, they cannot supply any stored solar energy after dark. This wouldn’t be an issue if the solor panels were connected to the primary power distribution lines. In this case, the solar panels could supply unused power to the grid during the daylight hours, only to be taken from the grid during the night. However, the company’s documentation specifically states that its product connects to secondary power lines, therefore it cannot supply (primary, untransformed) power back to the grid. Another solution would be to tie the solar panel output into secondary power going into local homes for immediate use. However, evidence suggests that solar panel energy supply to Westwood homes was particularly avoided. For example, the solar panel installed on the pole in front of 134 Kinderkamack Road is configured to supply power to a street light hundreds of feet away (at the northwest corner of Kinderkamack and Old Hook) rather than to the two homes across the street or to #134. By the way, the street light supplied by this solar panel is also redundantly tied into two other solar panels. So, these solar panels are sitting there on a pole all day, generating electricity that can’t be used by street lights which aren’t turned on. When it’s dark, the street lights are powered by grid power (not solar power). The only difference is that a ton of money was (apparently) wasted on many (seemingly) useless solar panels. Something is wrong with this picture, and for once it doesn’t look like the Borough of Westwood is to blame. A series of phone calls to Petra Solar resulted in a number of disconnections and unanswered phones. PSE&G was not immediately available for comment.